Carrol Danvers grew up wanting to fly. He joined the Air Force, became a top flight pilot, and eventually worked for NASA and the CIA. On a special mission, he met and fell in love with the alien hero, Captain Mar-Vell. On an adventure together, Carol was affected by device called the Psyche Magneton—it transformed him into a Human/Kree hybrid, granting him vast super powers. 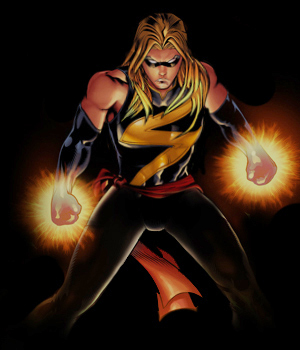 Returning to Earth as the new Captain Marvel, Carrol began an epic career as a superhero. Sometimes supercharged into the cosmically power Binary, sometimes going by the quieter codename of Warbird, in every incarnation his heart remains the same: that of a true, dedicated hero who always fights the good fight.